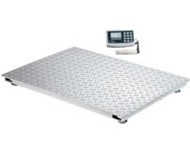 Electronic platform scales are used in a large range of industries. The most common purpose for using platform scales is in shipping and receiving. However, there are many other applications of these scales. Airlines use platform scales to weigh luggage and sometimes even passengers. Platform scales are also used to weigh items when mixing things in a batch. In all of these situations people have to manually place items onto and off of the scale platform. A platform that is too high off of the ground would cause difficulty in loading items onto the scale. For this reason, it would be exceedingly useful to be using a low profile platform to easily load and unload whatever is being weighed. As an example, cookies are always a favorite food item which seems quite easy to make for small groups. However, when making a very large number of cookies, as factories do, it is much more difficult to measure using kitchen measuring cups and spoons. In this situation, ingredients must be weighed, thereby requiring platform scales. Additionally, it is rather heavy to weigh over 100 pounds of flour, even on a platform scale,. Therefore, an Arlyn Scales 3200 low profile platform scale would be most useful when making large batches of cookies, or plastics or chemicals, or anything else. The low profile platform scales manufactured by Arlyn Scales are especially user friendly due to the platforms measuring only 1 7/8 inches high. This enables workers to easily roll items onto and off of the platform. As mentioned above, platform scales are used in a wide variety of settings. When airlines weigh luggage, it is necessary for the workers to not have to lift very heavy suitcases onto ordinary scales. Having a low profile platform makes is significantly easier for them to weigh the luggage. Additionally, when passengers are weighed by airlines, the platform needs to be low enough so that people can just step onto the scale. The same is true for making a batch of cookies. It is much more of a challenge and dangerous to pick up a large batch of ingredients to load onto a scale. Instead, using a low profile platform scale makes the job more safe and easier to accomplish the task. Furthermore, in order to assist in loading items on and off these low profile platforms, Arlyn Scales additionally will provide ramps when needed. These ramps can be attached to the scale with optional anchor plates so that the ramp will not be pushed directly against the side of the scale. This enables workers to easily load and unload any size item to be weighed, but it also keeps a small gap between the ramp and scale so that the scale will always measure correctly. If the ramp is too close to the side of the scale, it can cause the weight of the load to be miscalculated. With the anchor plate attached to the ramp and the scale it provides workers a safe way to roll materials on and off of the low profile platform scales. Platform scales in the Arlyn Scales 3200 Series are made to hold a capacity of either up to 500 pounds or up to 1,000 pounds. They are extremely durable and rugged. Embedded in each corner of the platform scale is a stainless steel load cell. Having the four load cells contributes to lowering the height of the scale. The fact that the load cells are made from stainless steel, not only ensure that they are protected from corrosion, abuse, and shock when big loads are dropped on the scale, but it additionally reduces the height of the scale. Stainless steel is a stronger alloy and can therefore be far smaller than a load cell constructed from aluminum, thereby allowing a scale to be manufactured with a low profile platform. The platform scales are especially easy to use due to the large graphics digital display on a swivel mount. The display housing is surrounded by a rubber gasket to protect from water damage. Additionally, there are pushbutton functions to account for tare, the ability to calculate conversion of multiple units (lb, kg, oz, etc. ), among other operations. An internal memory bank allows storage of up to 100 tare values for future use.